The East Coast’s No. 1 mixed martial arts promotion makes its long-awaited Connecticut debut later this month with a historic fight card featuring the region’s rising stars and familiar fan-favorites. Launching a new era as the first promotion to host a sanctioned MMA event in the state of Connecticut, CES MMA 55 invades the Connecticut Convention Center live on UFC Fight Pass Friday, March 29th, 2019 , nine years since breaking ground as the first to promote in the state of Rhode Island. The event features the highly-anticipated return of Hartford native and UFC flyweight contender Matt Bessette (22-9), heavyweight Parker Porter (8-5, 4 KOs) of nearby New Britain, and Philadelphia’s own Jeremiah Wells (6-1-1, 2 KOs) in the first defense of his CES MMA World Welterweight Title. The main card streams live on UFC Fight Pass with Michael Parente handling play-by-play alongside color commentator and longtime UFC vet “Filthy” Tom Lawlor. Showtime is 7 p.m. ET for the preliminary card. Tickets for the event are priced at $35.00, $50.00, $125.00 and $150.00 (VIP) and are available for purchase online at www.cesmma.com or www.ctconventions.com or by phone at 401-724-2253. All fights and fighters subject to change. The 34-year-old Bessette, a seven-time CES MMA vet, returns to the promotion for the first time since May of 2017 and fights in his home state for the first time since 2016 when he starred on the main card of Bellator 153 at Mohegan Sun Arena. Bessette is 6-1 lifetime with CES MMA and has won seven of his last nine fights, including a career-best seven-fight win streak from October of 2015 to May of 2017. During that stretch, Bessette captured the then vacant CES MMA World Featherweight Title with a win over Joe Pingitore at CES MMA 37 and later headlined CES MMA 41 with an impressive, third-round knockout win over Kevin Croom. Porter makes his third appearance with CES MMA. The 33-year-old veteran has the noteworthy distinction of appearing on the promotion’s inaugural event in 2010, where he submitted regional rival Lee Beane in the opening round of their scheduled three-round heavyweight bout, in addition to appearing on its first event in Connecticut later this month. Eight years removed from his victory at CES MMA 1, Porter returned to the promotion to face Keith Bell at CES MMA 53. In between, Porter bounced from Bellator to Reality Fighting and enters his homecoming bout on the 29th having won two of his last three overall. Wells aims to bring his welterweight world title back to Philadelphia, the site of his championship victory at CES MMA 52 in August. That night, Wells won his third consecutive fight with CES MMA, defeating the durable Jason Norwood by five-round unanimous decision to capture the vacant title. Wells also boasts wins over regional standouts Gary Balletto Jr. and Jon Manley and carries a three-fight win streak into his first title defense. 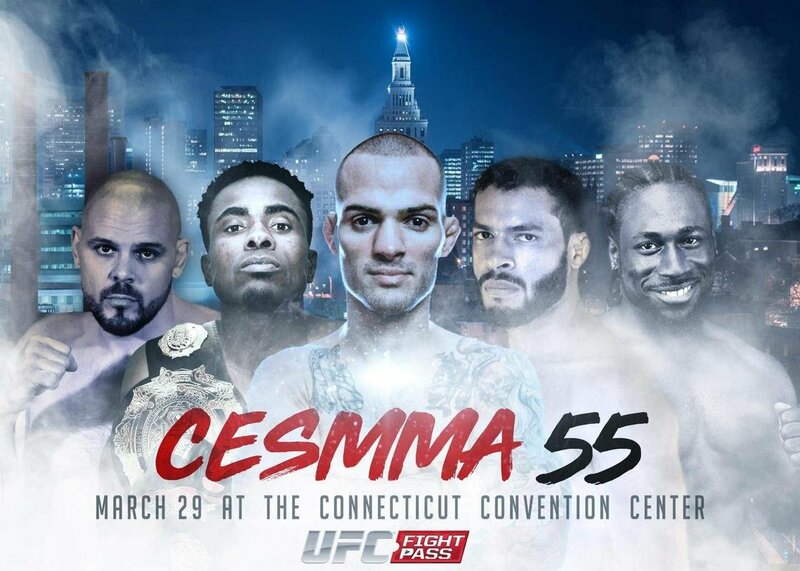 CES MMA 55 also features the return of Providence, R.I., middleweight Eric Spicely (11-4, 2 KOs) and unbeaten Connecticut light heavyweight William Knight (4-0, 4 KOs) in separate bouts. A six-time UFC and nine-time CES MMA vet, Spicely aims for his second consecutive win following a successful return to the promotion in January in which he earned just his second career win by knockout, stopping Leo Pla at 3:53 of the opening round. Knight also fought in January at CES MMA 54, recording his fourth career win by knockout against veteran Kevin Haley.